Don’t just take our word for it! A little something from our past bridal beauties. I booked Phoenix Makeup Collective for my October wedding and I am very happy I did! 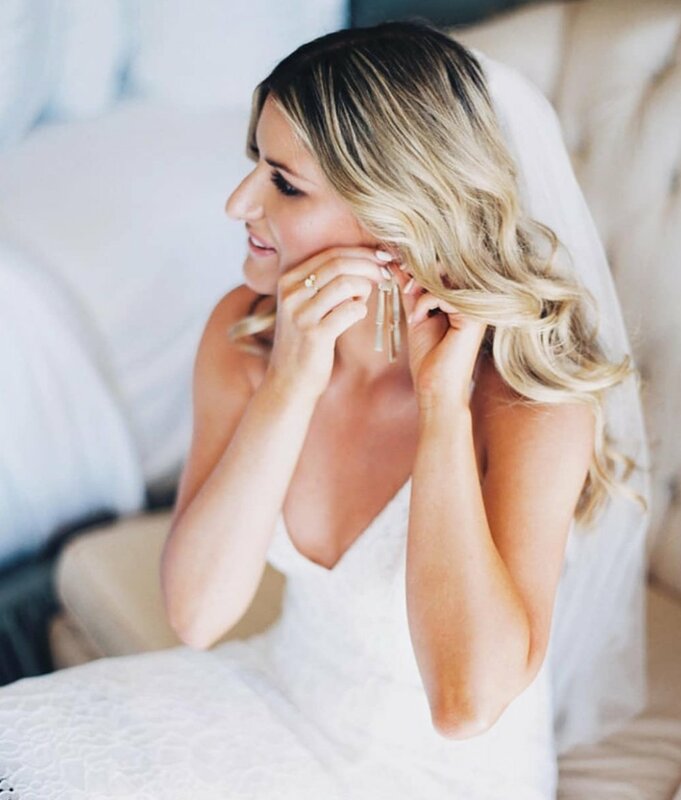 I am very particular when it comes to makeup, and your wedding day is one where you really want to go in feeling confident you're in the right hands. I did my trial and day of makeup with Bryanna and she was excellent. Knowledgable, easy to work with and she created the most beautiful look for my special day-I absolutely loved it and have gotten tons of compliments from it. The makeup looks spectacular in the pictures. She and her assistant did my makeup, my mother's, my mom-in-laws and 4 bridesmaids-all while being super professional, organized and making the process so easy! Definitely recommend PMC-they are the best of the best in the Valley! I found Phoenix Makeup Collective through instagram and requested a trial with Stephanie and Ana. I worked with Stephanie to schedule my appointments and found her to be incredibly responsive and helpful throughout the process. Oftentimes, I've been intimidated by makeup artists, since I have trouble articulating what makeup styles I like, or I feel bad about making tweaks. During the trial, Stephanie and Ana were so easy to talk to and when I wanted to change a couple of things I felt totally comfortable giving my feedback. Stephanie made it her mission to figure out exactly what I wanted and was great at interpreting my vision - even when I had no idea how to explain it! I loved that they took photos of my hair and makeup for me to look at after the trial. It helped to be able to look at photos a few days later and determine if I wanted to book them. After the trial, I booked them both for my wedding day. In the months leading up, Stephanie asked me to think about what I liked or didn't like, and let her know so that she could add it to her notes. On my wedding day, they arrived early. While bridesmaids were jumping in/out of the shower, Ana even offered to blow dry and put product in our hair. It sounds like a small thing, but it was so nice to have her be so attentive and willing to help make us feel extra pampered. Stephanie had kept track of all the notes I made about my makeup and did an amazing job making my vision come to life. I almost NEVER like my makeup when I have it professionally done, or have lots of tweaks, but that day, I had no complaints! It was even better than I had imagined. I can't express how glad I was to have a makeup artist that understood me and who I felt I could trust. My bridesmaids and my mom all loved their hair and makeup too - and with this group, that is a tough thing to accomplish! Not to mention, they all looked gorgeous in my wedding photos. I also want to note that Stephanie and Ana both had a very calming presence all day and didn't rush anything, but still kept us on time. They blended in perfectly with our group and it helped me to be able to relax and know that they had everything handled. The morning of my wedding was weird and frantic, but it was such a relief not to have my hair and makeup be one of the things I worried about. Because of Stephanie and Ana, I didn't even have to think about what I looked like because they made me feel beautiful and confident all day long. One of the best decisions I made for my wedding was hiring Phoenix Makeup Collective. Thank you, Steph and Ana! Bryanna did both my trial And my wedding day makeup. She's so cool, down to earth, and amazing at what she does. After my trial I went home and there were a couple minor things I wanted changed for my big day and she took note of this and made sure on my wedding day my makeup was done exactly how I wanted! My makeup looked flawless and lasted all day and night even in the 90 degree heat for pictures. I wish she lived with me and could do my makeup everyday cause I will never look that good again ;) She also did my moms makeup and she still raves about it til this day..I am so thankful my photographer recommended Bryanna and I would hands down recommend her to any bride! Thank you soooo much Bry!! Jenna is awesome!!! Your wedding day/week is already so hectic, and Jenna was an absolute angel. We arranged a meet up time and place a couple days before, and she checked in with me too to make sure we were still on the same page. Awesome because a couple things got away from me but she kept us on track! We met up at the hotel and she pretty much got started right away. I had 3 bridesmaids, 2 of them had really fine and short hair, and one had long hair and straight. I have very thick wavy hair. For the two girls with short hair, Jenna gave them a ton of volume and waves--which looked incredible on them. The other girl got this gorgeous pull through braid from Jenna. It was beautiful! Everyone hair looked amazing! I had wanted a crown braid but wanted it too be a little whimsical--Not perfectly in place. She did exactly that, it was a beautiful, full crown around the world braid, and it didn't even take that long! She then did our makeup, which wasn't super caked on, it was the perfect amount, and the colors went perfect with our dresses. I was so happy with it--I couldn't ever imagine it would all look as good as it did! Not only that, but it all lasted all night! I had never worn lashes before either but they stayed on all night with no issues. It couldn't have been more perfect. So happy to have worked with Jenna, I highly recommend her and the Phoenix Makeup Collective!! I was referred to the Makeup Collective and decided to work with Stephanie and Jenna for my wedding in November. They really made the whole experience so seamless and enjoyable. They both listened to my vision, and were very patient when I changed my mind of certain things. I could not have been happier with how things turned out! I got so many compliments from guests on my hair and makeup. My bridal party was also very happy with their results and both Stephanie and Jenna's assistants also did a great job. I would highly recommend them and plan to work with both again for special occasions. They are amazing!! They did my wedding day makeup and I am so thankful that I went with them. Bry did my makeup trail and wedding day look. She is amazing. I had two makeup artists the day of and everyone looked beautiful. My hair was also perfect. Love Jenna and the team that worked on us! Stephanie at Phoenix Makeup Collective is amazing and I highly recommend her as a wedding makeup artist! I was extremely happy with how my makeup turned out for my trial and wedding! She was so nice, easy to work with, and was very flexible. My makeup blended perfectly with my skin and it lasted all day long! Stephanie can do various styles of makeup and can do anything that will make you look stunning! You will not regretting booking with Stephanie! Thank you for making me feel even more beautiful on my wedding day! Bryanna did both my trial and wedding day makeup. She and her assistant were simply amazing! There was not a single thing I wanted adjusted on my makeup after she was done (and I can be very picky)... she nailed it! Her experience and talent shows. It lasted all day in the 90+ degree sunny AZ weather and photographed beautifully. She also was so helpful with skin preparation and product recommendations leading up to the big day. Her calming presence and organization on the day of was just what I needed. Bryanna and her assistant did my bridal makeup, plus 7 bridesmaids, 2 mothers, an Aunt and a cousin. They were not rushed and did a great job on the variety of ages and skin tones. Hands down would recommend Phoenix Makeup Collective for anyone looking for a confident and skilled wedding makeup artist! After a long search to find hair and makeup for my wedding I found Stephanie and Ana from Makeup Collective. They did a hair a makeup test and two days of hair and makeup around my wedding and for my wedding day. Everything was perfect and they were so easy to work with. They were great listeners and made sure the makeup was something I was comfortable with and felt like me; I didn't not find this easy with other companies who could only apply one way. The team also did hair and makeup for my six bridesmaids, mom, and mother-in-law. They stuck on schedule and everyone looked and felt amazing. They also did touch ups on site to make sure we were perfect to walk down the aisle. I would highly recommend them for any hair and makeup need!